Governor Andrew M. Cuomo today announced the nation's largest hydroponic commercial greenhouse will locate its operations in Monroe County. Clearwater Organic Farms, LLC, will build a 15 acre, 650,000 square-foot facility at Eastman Business Park. The company will produce fresh, locally grown, organic baby leaf greens year round. The project will create 137 new full-time jobs, most of which will be in packaging, shipping, receiving and warehousing and 55 of those jobs are reserved for veterans or those who are underemployed to support the region's anti-poverty agenda. "The new Clearwater Organic Farms facility will drive innovation, create jobs for New Yorkers who need them most, and bolster economic growth throughout the region," Governor Cuomo said. "Our economic strategy continues to generate new activity, attract high-growth industries to the region and build momentum to move the Finger Lakes forward." Clearwater Organic Farms Chief Executive Officer, Phillip Theodore said, "We are very pleased with the level of support that we’ve received from the State of New York the County of Monroe and COMIDA to bring innovative and leading technology to the Finger Lakes Region. Furthermore we’ll be providing pesticide free, fresh, locally grown and organic produce on a year round basis to the consumers in a 400 mile radius of the city of Rochester." 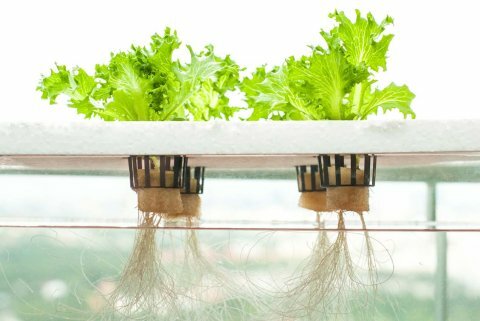 The on-site process will use Hydroponics to offer a fresh organic alternative to current market supplies. It intends to build a clonable, scalable and sustainable food source system that can be replicated throughout the United States and the world. The project will also be a significant user of the onsite RED Utilities at Eastman Business Park. The state of the art facility is expected to be completed by the end of 2017. In order to encourage Clearwater Organic Farms to build in the Finger Lakes region, Empire State Development has offered up to $4 million in Upstate Revitalization Initiative funding and $2 million in Excelsior Jobs Tax Credits, which are tied to the commitment to create more than 135 new jobs. The total project cost is approximately $50 million. Supporting the economic redevelopment of Eastman Business Park and tackling the roots of poverty are among the top priorities of the Finger Lakes Regional Economic Development Council and the region's Finger Lakes Forward Initiative. The controlled environmental agriculture facility uses 90 percent less water than field grown alternatives, 20 percent of the land, and uses sophisticated computer systems to control plant growing conditions, plant quality and energy usage. Clearwater Organic Farms is an indoor facility and is a fully vertically integrated operation with seeding, growing, harvesting, washing, packaging and cold storage on site. Clearwater Organic Farms Partner Peter Ciriello said, "When we set out to plan and design Clearwater Organic Farms, Rochester, our goal was to build a world class baby leaf production facility using ‘state of the art’ process technology and grow science that would both be environmentally and socially responsible. We recognized that we could create real value in growing and providing fresh, local and safe baby leaf vegetables and herbs to the local markets and still have a project that would be energy efficient and one that would provide job and career opportunities for workers that might not otherwise be able to work in food production. We appreciate the support we have received from the State of New York, Monroe County, the Town of Greece, and our many strategic technology and commercial partners to make Clearwater Organic Farms in Rochester a reality." Empire State Development President, CEO & Commissioner Howard Zemsky said, “Under Governor Cuomo’s leadership, New York State is committed to supporting innovative agriculture and food production partnerships, like Clearwater Organic Farms, in an effort to grow jobs and our economy. The agriculture industry is a cornerstone of the state economy and this project will create opportunities that shape the Finger Lakes’ agriculture and food industries, ensuring its vitality for years to come." President of Eastman Business Park and Corporate Real Estate, Dolores Kruchten, said, "Clearwater Organic Farms fits wonderfully into our vision for Eastman Business Park and we are honored that they chose the Park as the ideal location to construct the largest hydroponic growing system in the United States. The assets at Eastman Business Park including the abundance of water available, the efficiency of steam heat delivery and proximity to key U.S. and Canadian markets, make it a perfect fit for this advanced, agricultural systems integrator that has partnered with the world’s leading aquaculture and hydroponic technology experts." Finger Lakes Regional Economic Development Council Co-Chairs, Monroe Community College President Anne Kress and Wegmans Food Markets CEO Danny Wegman said, "Clearwater Organic Farms is a priority project for the FLREDC. We see that the agriculture and food business is changing rapidly with consumers demanding healthy, high quality, locally grown food. This new technology company will help us fulfill those demands and will help build on the world class food ecosystem in the region. Another important component of today’s announcement is that this innovative company will offer jobs to those impacted by poverty and who have served our country. Incentivizing these kinds of projects is essential to creating a “Pathways to Prosperity” which at the heart of the poverty reduction goal in the Finger Lakes Forward strategic plan." State Senator Joe Robach said, "Today’s announcement that Clearwater Organic Farms have chosen Eastman Business Park to locate as they grow their business in New York State is a positive one for our area. By choosing to call EBP home, Clearwater Organic Farms is ensuring that families across our region will have access to fresh, organic and locally grown produce year round, while creating jobs for local residents. This is exciting news for both consumers and for the economic growth of our community." Monroe County Executive Cheryl Dinolfo said, "Our region has long been a hub for advanced manufacturing businesses and now with the arrival of Clearwater Organic Farms, we are the home to trend-setting, advanced agricultural techniques that will be a model for projects across the country. I’m proud to support Clearwater Organic Farms as they take root in our economy, providing over 100 jobs to residents right here in Monroe County." Mayor Lovely A. Warren said. "Thanks to the investment of Governor Cuomo and New York State, Eastman Business Park is again emerging as an important jobs center for our city and region. Not only will today’s announcement create jobs for our citizens who need them most, but by doing so it will help us create safer and more vibrant neighborhoods and better educational opportunities. I am proud to welcome Clearwater Organic Farms to Rochester and to Eastman Business Park, and am convinced, now more than ever, that our future is as bright as our past." Today's announcement complements “Finger Lakes Forward,” the region’s comprehensive blueprint to generate robust economic growth and community development. The State has already invested more than $3.4 billion in the region since 2012 to lay the groundwork for the plan – investing in key industries including photonics, agriculture and food production, and advanced manufacturing. Today, unemployment is down to the lowest levels since before the Great Recession; personal and corporate income taxes are down; and businesses are choosing places like Rochester, Batavia and Canandaigua as a destination to grow and invest in.